It is important to have balance and be mindful to be a good leader. After earning an international MBA, I first worked as a management consultant out of Manhattan and later in private equity. In private equity, I managed relationships and raised capital from institutional investors, eventually directing fundraising events north of a billion dollars. I then decided to found my own firm and was in the process of securing an anchor commitment in our fund when the Global Financial Crisis started. It soon became clear that we were in the middle of a protracted recession. We lost that funding source in the crisis and, at a point, I concluded that the time wasn’t right for that business. I decided to weather the recession by doing something to better my health and wellbeing with the intention to resume my professional work later. I always prioritized my health, and over time yoga became a more important part of my weekly workout routine. I decided to register for my entry level yoga teacher certification that took just under a year to complete. Upon graduation, I didn’t have all of the answers I yearned for, so I soon enrolled in an advanced yoga teacher training lasting another twelve months. I wanted to understand the science behind yoga and its philosophy. I wanted to know what the yoga was doing to me that caused me to feel better, think more clearly, feel calmer, and more positive. The more I learned the more I felt a calling to share this material outside of yoga studios and to other professionals in particular. 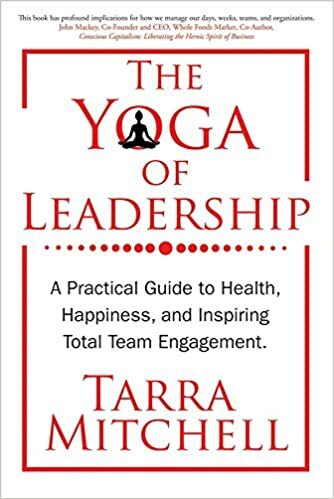 I embarked upon an audacious project of weaving together yoga wisdom, my personal experience, and leadership into the approach shared in The Yoga of Leadership, which serves as a guide to health, happiness and to embodying qualities essential to success, essential to inspiring others. What is a leader to you? A leader by conventional definition is simply a person of influence. I elevate that definition and believe inspiring leaders serve as positive examples to others, acting with principle and purpose. Leaders that possess qualities essential to success and who are able to connect with and inspire their teams have figured out one way or another how to care for themselves holistically. Inspiring people are also principled. It is from some deeply felt sense of purpose and meaning that leaders derive charisma and it fuels their motivation. I call this “mojo” in my book. It’s that twinkle in their eye that results in their ability to get others to follow them. Great leaders invest in their success by making helpful and health-serving choices. It is through their life choices that these essential leadership qualities present themselves. Good leadership qualities are embodied and aren’t taught to a person via a formula. You have to be in place of holistic balance where you feel healthy and well, and with intention, these qualities can present themselves. Can a leader go overboard on discipline? Sure. It’s all about balance. I recommend balanced discipline in all areas of our lives. Most of us need to work toward a more balanced discipline through our lives as times change and priorities shift. Most leaders are disciplined in some way or they wouldn’t be in a leadership role to begin with. But if they aren’t engaging their team or they are not caring for their health, for example, then they aren’t disciplined in other ways. Being a workaholic isn’t a discipline, rather the opposite. It is a lack of discipline. A lack of discipline in recognizing when productivity diminishes and calling it a day. Stress manifests from imbalance. One way that yoga works is by bringing the practitioner to a more relaxed state. This is done through tension release when moving through poses on a mat and also through the breath. A vital component of a yoga practice is a focus on the breath and teaching the practitioner to lengthen and control his or her rate of respiration. This breath practice invites the nervous system to relax and emotions to calm. When the nervous system relaxes in this way the mind quiets too. So, the thoughts that were racing and jumping around making a person stressed, begin to have less power or control over the person. This is the science of the yoga asana (movement) practice that can move a person from a state of stress into a calmer state. I discuss this process from a more technical standpoint in the book. Do you believe in yoga / meditation breaks in an office? Any advice on that? I think it depends on the person and the organization. In general, it is important for organizations to educate their leadership and their teams on holistic wellbeing and to begin to expect people to do what they need to and take care of their minds and bodies. This will decrease healthcare costs at the organization and improve team engagement. And it is important that organizations allow their leaders and teams time in the day to do what they need to do to keep their stress levels at bay and find a sense of balance. Generally speaking, I believe in educating people on all the various ways they can help themselves holistically, offering them guidance, encouragement, and support/time. I don’t believe in forcing any of this. Ultimately, I think it needs to be up to each person, allowing he or she to choose what he or she wants to do because we are all very unique. We can educate, provide space in the schedule, and serve as examples but the rest is his or her own journey to follow. Because yoga movement practice helps with stress, I do think it is particularly helpful for employees having trouble with stress and anxiety or employees working in high-stress jobs like EMT’s to be taught the benefits of the yoga practice. It also helps people unwind from the habits of the day like sitting all day and improves posture and maintains mobility, both helpful to the vitality of a person. Meditation is an important part of the practice of yoga leading to a more balanced mind and helping to improve concentration and focus. I do think teaching people about the benefits of meditation and ways to practice meditation is a good idea. Ultimately, people should have the flexibility to take the time to care for themselves. If work has to be highly inflexible then perhaps allocated ‘breaks’ might make sense but I still think individuals need to be self-motivated to care for themselves. The eight limbs of yoga are threads of knowledge contained in Patanjali’s famous book called The Yoga Sutras. The Yoga Sutras is among the most widely leveraged resources of wisdom for yoga teachers today. The eight limbs include social and personal principles, the movement practice, breath regulation, sensory control, concentration, meditation, and integration. Yogis are taught to practice the eight limbs and move through the eight limbs as a life-long effort. I will offer simply that living life by following the eight-limbed path is one way to minimize your own suffering in life. Why is balance so important? How can we all practice kindness? There are three qualities in nature according to yoga and a fundamental principle is to orient your life toward making choices that would be considered harmonizing, health-serving, and balanced. For example, I know I feel sufficiently energized yet balanced when I do strong yoga movement (asana/poses) practice about 3x times a week, western exercise at least 2x a week, and a 20-minute morning meditation practice every day. I emphasize currently because as schedules and priorities change and as I age and as my kids age, my needs and what’s possible will most certainly change. I also try to eat a healthy diet, sleep soundly, and treat everyone with kindness and respect. I say try because I’m imperfect. That’s why yoga has to be a lifelong practice. Kindness is a social principle described in my book. It’s one of the yamas, which is one of the eight limbs of yoga referred to above. We can all practice more kindness by making efforts to see people, look them in the eye, smile at them. We can thank them honestly if they are serving us in some way. We can practice kindness by paying others a complement for a job well done or just because. We practice kindness by seeing everyone around us as equals and seeking to remove the labels and biases that our minds automatically pull up from our memory banks. This all requires that we return to a human touch, return to humanity, to deeper connections. And there is one necessary thing that has to happen to restore these connections, to see people again, to be kind to them. There is one thing that must happen – we must spend less time in our day looking at screens on our mobile phones and computers and more time looking into the eyes of another human. Do you think Trump does yoga? If he did yoga do you think it would help the situation we are in right now? What is your suggestion to world leaders? Based upon what I see, I do not believe that President Trump has a yoga practice but I’d be delighted to teach him the practice of yoga! If President Trump had a consistent yoga practice, among other things, I do not believe the White House would have a revolving door of talent. My suggestion to world leaders is to make sure they are operating while using their layer of knowledge. When using this layer, we are thoughtful, remove bias, contemplate, inquire, seek guidance from other experts, and respond with full information and discernment. We wield great power when we have control over our mind and emotions like this. It takes practice and time but is an evolved way to function as a human and necessary for great, inspiring leaders. A lack of control results in impulsive and erratic behavior and is a weakness often directed by a false ego. I detail this layer in a chapter in The Yoga of Leadership by the same name and it is very important to leaders. What are your best tips for raising energy during the day to bring your best self to work? First, you need to get a good night’s rest consistently. There is no ‘making up for’ lack of sleep when it comes to energy. We all have different needs when it comes to sleep but as I mention in my book, sleep is fundamental – everything else goes downhill without a consistent and quality night’s rest. Some may do well on 6 hours but most need closer to 7 or 8 hours a night. You’ll never bring your best self to anything if you don’t get a solid night’s rest on a pretty consistent basis. Assuming you allow yourself to get your needed z’s, you have many options to help raise energy during the day. I recommend a light, healthy lunch to ward off mid-day sluggishness. An outside, short speed walk after lunch is really helpful. If you don’t have time in the morning, book your personal training session in the early afternoon, which will fuel you for the rest of your workday. Are there any supplements / herbs you think everyone should take? I’ll never proclaim any-thing for every-one. An underlying premise of my book is that we are so very unique that anyone who is selling a thing as a one-size-fits-all is a business trying to make money. This goes for any one diet, fitness class, etc. So, to answer this question directly, I don’t. What I’d like to share that I do find helpful, I also discuss this in my book, is the benefit of nutritional screenings. I do believe in comprehensive blood tests that assess how well you are absorbing nutrients and where you may be deficient. Then once you know your specific deficiencies you can change your diet and you may need supplements to make up for the deficiency. With a screening like this, you know exactly what you need instead of taking something because everyone else is taking it or because the doctor knows it helped someone else and thinks that maybe you need it too. I love these tests and supplementing where I was deficient made a real difference in my energy level. I’m a middle-aged mother of two and speaking with integrative physicians about my health has also been helpful and they have guided me toward supplements for me to try. Last question so we don’t give the book away, but how does one expand their mind? The first step is setting an intention to want to expand your mind, or, stated differently, become more conscious in one’s life. The second step is self-awareness. As I outline in the Mind chapter, it takes intentional self-reflection, self-examination to become more self-aware and uncover what makes you tick, what lights you up inside, what dims that light, what you believe and why, what shaped your worldview, etc. And once a person spends time examining these things as he or she moves through his or her life, that newfound self-awareness begins to usher through subtle mental shifts. Should I keep doing these things? Should I be spending more or less time with these people, that affect me in this or that way? Should I regard or disregard the opinions of this or that person or news source? Have I looked at all sides in a truly balanced way or am I operating simply out of emotion and personal bias? Am I seeing things clearly? Are those long-held, deep-seeded beliefs and perspectives helpful? Do they support my health and wellbeing? Do they support healthy relationships, connection with others? Do they support an orientation toward making the world a better place, really? Am I leading a meaningful life? This is one way consciousness expands as it moves us into a state of discernment where reasoning can prevail through questioning, observation, and learning from other knowledgeable sources. We broaden our base of knowledge and our intelligence, operating with expanded consciousness. We can also expand consciousness in regular deep meditation practice where we tap into the depths of our subconscious awareness and impressions (images, stories, things, ideas, thoughts, memories) come up into our conscious mind that wouldn’t have come up otherwise. In the Knowledge chapter I cover all of this in greater detail.